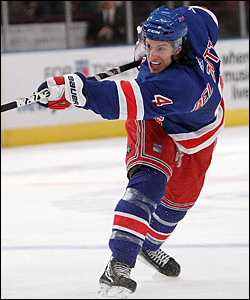 New York Rangers defenseman Michael Del Zotto has been named to the 2010 NHL All-Rookie Team. He is the first Rangers player since Henrik Lundqvist in 2006 to be named to the NHL All-Rookie Team, the first skater since Mike York in 2000, and just the second Blueshirt defenseman ever after Brian Leetch in 1989. Del Zotto, 19, registered nine goals and 28 assists for 37 points, along with 32 penalty minutes in 80 games this season. He made his NHL debut in the Rangers' season-opener at Pittsburgh on October 2, becoming the youngest defenseman to suit up for the club since 18-year-old Dave Maloney in December 1974. Michael Del Zotto is the first Rangers skater to make an All-Rookie team since Mike York in 1999-00 and only defenseman other than Brian Leetch to do it. Del Zotto tallied his first career point with the game-winning goal the next day on October 3 vs. Ottawa, becoming the first teenager to score a goal for the Rangers since Manny Malhotra (1998-99) and the second youngest defenseman in team history to accomplish the feat behind Red Garrett. It was also the first game-winning goal tallied by an NHL rookie in 2009-10. Del Zotto went on to capture NHL Rookie of the Month honors for October, leading all rookies in scoring at the time with 12 points (four goals and eight assists) in 14 games. He finished the season ranked first among all NHL rookies in power play assists (18), second in power play points (22) and tied for fifth in power play goals (four). He also ranked second in the NHL among first-year players in hits (162), fourth in assists and blocked shots (92), seventh in points and tied for 15th in goals. Del Zotto led the team in power play assists, ranked second in power play points, third in assists, tied for fourth in points, and ranked fifth in power play goals and eighth in goals. In addition, he led all team defensemen in goals, assists and points. The Rangers posted a record of 20-6-4 when he recorded a point, and were 5-1-1 when he tallied two points. He also registered eight points (two goals and six assists) in a seven-game span, beginning with his 30th point of the season on March 21 at Boston (goal) to April 6 at Buffalo. The Stouffville, Ontario native was originally the Rangers first round selection, 20th overall, in the 2008 NHL Entry Draft. Joining Del Zotto on the NHL All-Rookie team is fellow defenseman Tyler Myers of the Buffalo Sabres, who also won the Calder Trophy on Wednesday as the league's Rookie of the Year. Others on the All-Rookie team are forwards Niclas Bergfors of Atlanta, Matt Duchene of Colorado, and John Tavares of the Islanders, and Detroit goaltender Jimmy Howard.